EQyss® shampoos are among the most sought after pet grooming products in the industry. Special, non-toxic formulas are designed not to damage or coat hair and contain special ingredients to pull moisture from the air to hydrate and replenish coats. 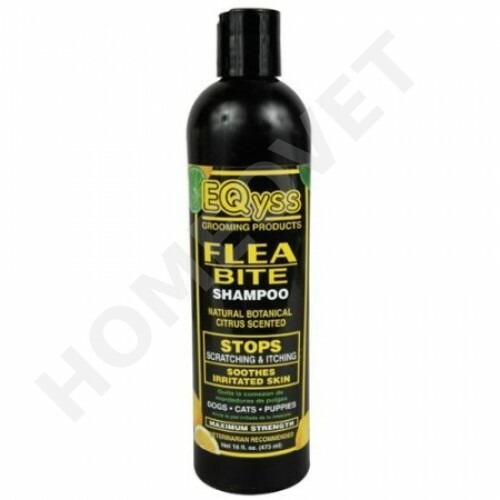 Flea Bite Shampoo uses citrus and d-Limonene to stop itching and scratching caused by fleas fast. Triple-action formula includes ingredients to stop insect related skin reactions. Gentle shampoo leaves coats moisturized. Citrus scentedEQyss Flea Bite Shampoo helps you to get this problem under control and calm the skin again! and after 5 minutes rinse well. Avoid contact with eyes.